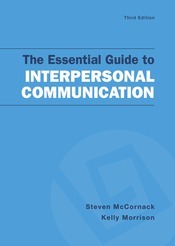 Newly authored by Steven McCornack and Kelly Morrison from scratch, this new The Essential Guide to Interpersonal Communication is a brief and inexpensive, supplemental text that can be packaged with any of our texts or purchased on its own. It is a good alternative for OER situations either for the interpersonal course or combined with other guides (like The Essential Guides for Group or Intercultural Communication) for larger survey courses. This edition is fully up--to-date with today’s interpersonal scholarship, includes examples that connect with students’ experience, and includes new self quizzes to engage students in self-reflection.